Combining local ingredients with a regional flair, Karami Salsa joins the great flavors of green chiles with a delicious twist. What if the ingredients for a beloved side dish from your native country are not just hard to come by, they’re impossible to procure? The first generation of Karami Salsa was born from this predicament. Japanese immigrants arrived in the high plains of Colorado in the 1890s to work the newly irrigated farmlands and build the transcontinental railway. They eagerly started new lives in a new land. 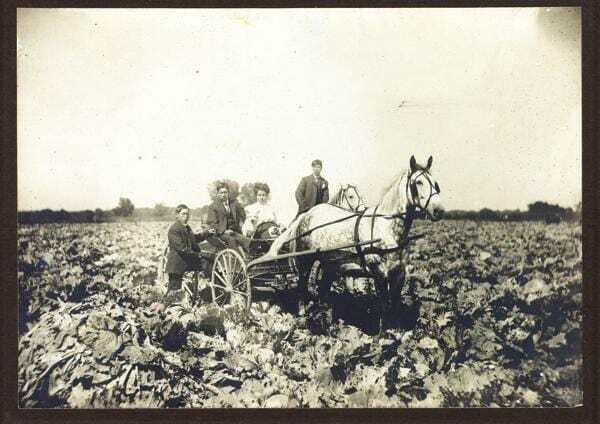 Japanese immigrants farming the high plains of Colorado. But there was one thing they missed. In Japan, every family had its own version of tsukudani, a traditional, salty topping made with kombu seaweed used over rice. Nearly 1,500 miles from the ocean, Colorado didn’t have kombu, but the Japanese community soon saw the textural similarities of the local spicy green chili pepper. Like Japan’s tsukudani, the Hispanic influence in Colorado meant every family had its own recipe for taking the whole peppers and turning them into a family recipe of salsa enjoyed with many dishes. Fast forward more than 100 years to Boulder, Colorado. Business partners Kei Izawa and Jason Takaki co-founded Teppei, LLC, to develop organic and natural Asian sauces. Its initial product launch was exporting raw, blue agave nectar to Japan, which is still a mainstay of the company’s focus. 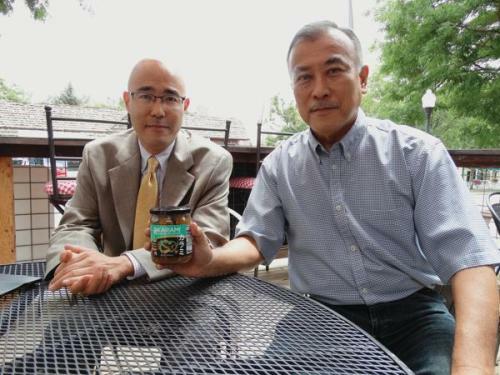 Business partners Kei Izawa and Jason Takaki , founders of Teppei, LLC, and creators of Karami Salsa. The partners also wanted to develop a product to sell in the US, but they hadn’t hit on the right idea yet. This changed at Christmastime in 2012. Takaki, a fourth-generation Japanese American, whose father was mayor of the southern Colorado town of Pueblo, grew up with the dual influences of Japanese and Mexican cuisine. Takaki pulled five pounds of the spicy peppers from his freezer with the intention of making green chili for gifts. But as he started the process, he recalled a taste from his childhood – the Takaki family’s tsukudani. He added soy sauce and some of Teppei’s organic agave syrup to the local chili peppers, bottled it, and presented it to friends. Fortunately, he gave a jar to Izawa and his wife Mariquita. They opened it, smelled the fresh ingredients, saw the great texture and bright visual appeal, and then tasted it. As they say, the rest is history. “This is it!” Izawa told Takaki. The name Karami (pronounced ka-Rah-me) means “Beautiful Heat” (辛美), but while labeled “hot” on the jar, the heat of Karami Salsa is pleasing rather than mouth-numbing and overwhelming. The addition of organic agave, gluten-free tamari soy sauce, and a touch of garlic result in great flavors at different levels. Perfect heat, a tiny bit of sweet, and just the right amount of salt blend into a salsa that is simply delicious. Izawa also describes Karami Salsa’s flavor as being full of umami, the so-called fifth taste recognized in Japan as a flavor that is round, savory, and complete…and yet indescribable. 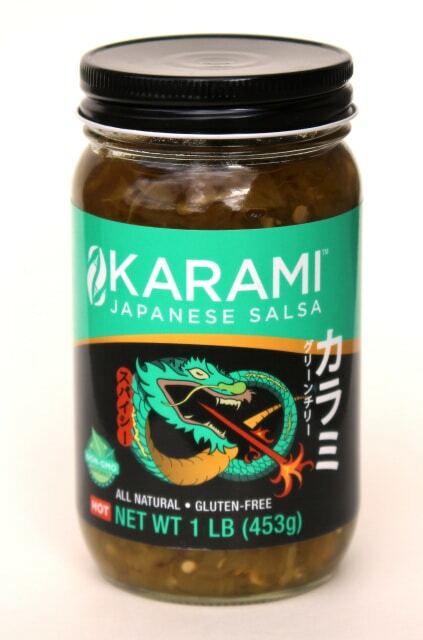 Karami Salsa is great as a topping for burgers, brats, hot dogs, omelettes, and pulled pork and tri tip sandwiches; over rice, fried rice, pasta, and quinoa; and, of course straight up with chips. The Flavor Team is excited to share the goodness of Karami Salsa with the Central Coast. The Flavor Team has the good fortune to know the Izawa family as a result of the Japanese martial art of Aikido, which we all practice. We enjoyed the great flavors of Karami Salsa over Chinese food at a recent visit to Colorado, and shared special time with great people.